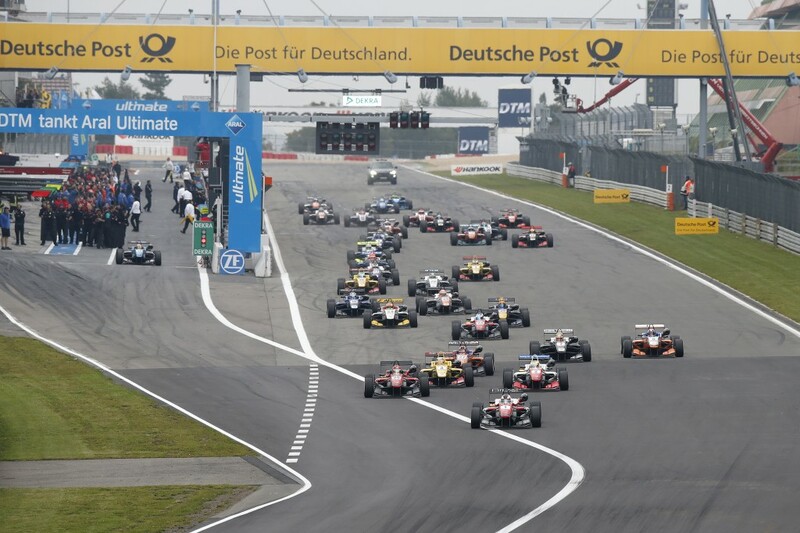 Jake Dennis's hopes of claiming a fourth podium finish on the trot in the first of the Formula 3 European Championship races at Nurburgring were dashed within yards of the start. The RSF-backed Prema driver - who took a win and two second places at the previous round at Portimao - made a strong start from fourth on the grid only to get shunted out of contention at Turn 1. The heavy contact thrust the luckless Dennis into the rear of Callum Ilott's car, off the track and heading back to the pits for a new front wing. He re-joined at the back of the 33-strong field, completing 10 laps before determining a points-paying finish was way beyond reach and retiring. Fellow Prema driver and points-leader Felix Rosenqvist took the win with a dominant lights-to-flag drive from pole to finish practically 6.5 seconds clear of team-mate Nick Cassidy who was followed over the line by Carlin rookie Callum Ilott. Fellow title contenders Antonio Giovinazzi - who got run wide in the Turn 1 fracas - and Charles Leclerc - who was responsible for the incident - finished 10th and fourth. Giovinazzi's demise hands his chief rival Rosenqvist a 58.5-points lead in the title race. The Swede leads on 403 points ahead of the Italian on 344.5 and Leclerc on 336.5. Dennis remains in fourth place on 309. Jake Dennis took ninth place in the Formula 3 Macau Grand Prix for the SJM Theodore Racing-backed Prema squad. Prema Powerteam's Jake Dennis survived an opening lap scare in the Macau Grand Prix qualification race to finish 11th. Jake Dennis mounted a strong recovery to finish seventh in the Formula 3 European Championship finale at Hockenheim after making a flawed tyre call ahead of the start.